The people of China have a rich and complicated mythology that dates back nearly 4,000 years. Throughout Chinese history, myth and reality have been intertwined. Historical figures have been worshiped as gods, and ancient myths are sometimes treated as historical truths. In addition, three great religious traditions—Confucianism, Taoism, and Buddhism—have played a role in shaping the mythology. The result is a rich tapestry of characters and tales, both real and imagined, and a unique pantheon organized very much like ancient Chinese society. New Religious Ideas. From about 1500 to 1066 B . C ., China was ruled by the Shang dynasty. The people at this time worshiped many deities, including natural forces and elements such as rain, clouds, rivers, mountains, the sun, the moon, and the earth. 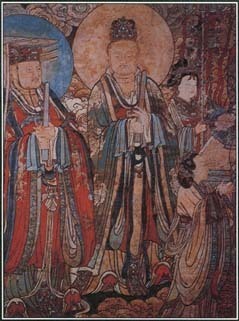 Their greatest deity, Shang Di, remains an important god in the Chinese pantheon. When a new dynasty, the Zhou, came to power in China in 1066 B . C ., significant changes took place in religion. People still worshiped the old gods, but ancestor worship became increasingly important. 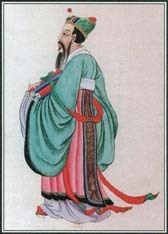 Confucianism and Taoism appeared near the end of the Zhou dynasty. These two religious traditions had an enormous influence on the development of the most basic and lasting principles of Chinese culture. Confucius attracted many followers during his life, and his ideas continued to spread after his death. Reverence for family and ancestors are important elements of Confucianism. Changing Old Beliefs. In 213 B . C ., many of the original sources of Chinese mythology were lost when Emperor Shi Huangdi of the Qin dynasty ordered the burning of all books on subjects other than medicine, prophecy, and farming. This order was reversed in 191 B . C ., and much of the literature was reconstructed. But works were rewritten to support ideas popular with the royal court at the time, including that of a hierarchy in government. These changes affected religious beliefs, producing a pantheon of deities that mirrored the political organization of the Chinese empire. Gods and spirits had different ranks and areas of responsibility, just like Chinese officials. Shortly before A . D . 100, Buddhism arrived in China from India and added another important influence to Chinese culture and mythology. Buddhist ideas gradually came to be merged with Taoism and Confucianism in the minds of many Chinese. The three traditions often were seen as different aspects of the same religion and as having basically the same goals. Buddhists and Taoists honored each other's deities in their temples, and both incorporated principles of Confucianism, such as ancestor worship, in their beliefs. Confucianism is more of a philosophy than a true religion. It does not include gods and never developed a mythology of its own. Confucianism is concerned primarily with human affairs rather than with the spirit world or the afterlife. At the same time, however, it emphasizes the importance of ritual and devotion to elders and ancestors. Confucius. Confucianism sprang from the ideas of one man—Kongfuzi, or Confucius. Born in 551 B . C . to a poor family of aristocratic background, Confucius began a teaching career after working as a minor government official. For Confucius, the goal of education and learning was self-knowledge and self-improvement, which would lead one to right conduct. Although his method of education was aimed at ensuring the smooth operation of a stable and well-ordered state, his teachings became a guide to living wisely as well. Confucius attracted many followers who spread his ideas after his death in 479 B . C . A number of legends grew up about Confucius, including one in which dragons guarded his mother when he was born. According to another story, a unicorn appeared at his birth and spit out a piece of jade with a prophecy written on it, saying that the infant would become "an uncrowned emperor." Considering the immense impact of Confucius on Chinese culture, the prophecy came true. A scholar at the Chinese royal court, Laozi supposedly wrote the Tao Te Ching, the main text of the Chinese religion Taoism. Although there are many legends concerning Laozi, little factual information is available regarding his life. important and must be performed in precise ways. By carrying them out properly, an individual can receive the aid and cooperation of deceased relatives. Misfortune, a sign of displeasure by the deceased, indicates that the proper rituals have not been followed. Despite its spiritual elements, Confucianism is not really concerned with the spirit world. It does not teach about gods, heaven, and the afterlife. Confucius himself supposedly remarked, "I stand in awe of the spirits, but I keep them at a distance." Confucianism is basically a philosophy that focuses on the real world and provides guidelines for how people should live their lives. Taoism, also known as Daoism, arose about the same time as Confucianism. This religious tradition had its roots in the nature worship of the earliest Chinese people. The word tao means "way," and Taoist belief is based on the idea that there is a natural order or a "way of heaven" that one can come to know by living in harmony with nature. Through an understanding of natural laws, an individual can gain eternal life. Laozi. The main Taoist work, the Tao Te Ching, was supposedly written by Laozi, a scholar at the Chinese royal court in the 500s B . C . Little is known about Laozi. The main sources of information, written hundreds of years after he lived, are legendary in nature. One of the most popular stories about Laozi concerns a voyage to the west, during which he wrote the Tao Te Ching. Other tales claim that Laozi met Confucius and that he lived more than 200 years. Although the true story of Laozi will probably never be known, he is widely respected in China. Confucianists consider him a great philosopher, while Taoists regard him as the embodiment of the tao and honor him as a saint or god. The Tao. While Confucianists emphasize the practice of ritual and ancestor worship, Taoists seek knowledge through an understanding of the natural world. An important Taoist concept is that of yin and yang, two opposing and interacting forces of nature. Yin is a feminine principle and represents such ideas as dark, negative, cold, passive, softness, and earth. Yang, the masculine principle, represents light, positive, heat, activity, hardness, and heaven. Yin and yang exist in a delicate balance, and the harmony of the universe depends on maintaining that balance. Originally a way of life, Taoism took on a more religious character after Buddhism arrived in China. Taoism adopted the use of temples and rituals and promoted the belief that all things have their own spirit. It also absorbed many mystical cults and created an elaborate pantheon as well as a new mythology. Taoist deities include nature spirits, ancient legendary heroes, humanized planets and stars, humans who became immortal through Taoist practices, and animals such as dragons, tigers, and snakes. All human activities—even such things as drunkenness and robbery—are represented by deities as well. The highest deity, Yu Huang-ti (the Jade Emperor), is associated with the ancient Chinese god Shang Di. Other central figures in Taoist mythology are the Eight Immortals, humans who achieved immortality in different ways. Buddhism arrived in China between 50 B . C . and A . D . 50, several hundred years after the rise of Confucianism and Taoism. One of its basic principles is that all suffering comes from earthly desire, and only by eliminating desire can one gain happiness. The founder of Buddhism, Siddhartha Gautama, was an Indian prince who lived at about the same time as Confucius and Laozi. Gautama gave up his princely life to seek truth and wisdom. When these were revealed to him, he became the Buddha, or "enlightened one." Buddhists believe that humans live many lives and are continually reincarnated, or reborn, to a new form of existence after death. An individual's actions in previous lives—known as karma—determine what type of existence that person has after rebirth. The goal of Buddhism is to escape the cycle of death and rebirth by achieving enlightenment and entering a timeless state known as nirvana, in which one is free of all desire. Because Buddhism holds out the promise of a better existence in the next life, it appealed very much to Chinese peasants, who suffered great hardship and poverty Chinese Buddhism became much more elaborate than Indian Buddhism, incorporating many Taoist and ancient Chinese gods. Among the most popular Chinese Buddhist deities are Emituofo, ruler of the Western Paradise, and Kuanyin, the goddess of mercy. Several common themes appear throughout much of Chinese mythology. Among the most significant are the creation of the world out of chaos, the importance of nature, and reverence for ancestors. When the world was still young, there were ten suns. Each took a turn being pulled through the sky in the chariot of their mother, goddess of the sun. One day, however, the ten suns decided to travel across the sky together. They greatly enjoyed their journey, but it brought disaster on the earth, destroying crops and drying up streams. Dijun, the father of the suns, felt sorry for humans and told his children to behave, but they would not listen. So Dijun sent Yi, a great archer, to earth with a magic bow and arrows to frighten his children into behaving. When Yi realized that neither threats nor persuasion would stop the suns, he shot his arrows into the sky and began killing them. After he finished shooting, only one sun remained—the one that travels through the sky today. The main Chinese account of creation involves the god Pan Gu, the son of Yin and Yang, who came into being in the darkness of chaos. After 18,000 years, Pan Gu had grown so much that he caused the light parts of the chaos to rise and become the heavens, while the heavy parts sank and became the earth. To keep the heavens and earth separated, Pan Gu stood up and forced them apart. He grew 10 feet a day for another 18,000 years until the earth and heavens became fixed in place. Pan Gu then laid down to rest and died. Various parts of his body became parts of the universe—the sun and moon, wind and clouds, and all elements on earth. The fleas on Pan Gu's body became humans. The importance of nature is stressed in legends such as that of the Five Sacred Mountains, which represent the main points of the compass and the axis of the world. The most sacred mountain, T'ai Shan, has Shang Di, the greatest earthly power, as its deity. Mount Kunlun, home of immortals, became the focus of various cults. Many Chinese myths deal with natural disasters, especially floods. Others deal with heavenly bodies such as the sun and moon. Animals, including dragons, pigs, and monkeys, are also important figures in Chinese mythology. Reverence for ancestors is another common theme in Chinese mythology. Long life is viewed as a sign of the gods' favor, and for many centuries, the Chinese have sought the secret of long life and immortality. In the past, Taoists believed that magic potions could be created that bestowed eternal life on people who drank them and that beings known as hsien gained immortality in this way. Both Taoism and Confucianism stress the importance of paying proper respect to elders, especially parents and grandparents, and deceased ancestors are honored with various ceremonies and rituals. See also Animals in Mythology ; Buddhism and Mythology ; Creation Stories ; Dragons ; Pan Gu ; Reincarnation ; Xian ; Yellow Emperor ; Yin and Yang .